Lateral torsional buckling occurs when an applied load causes both lateral displacement and twisting of a member. This failure is usually seen when a load is applied to an unconstrained, steel I-beam, with the two flanges acting differently, one under compression and the other tension. ‘Unconstrained’ in this case simply means the flange under compression is free to move laterally and also twist. The buckling will be seen in the compression flange of a simply supported beam. WHAT IS Lateral Torsional Buckling? Lateral torsional buckling may occur in an unrestrained beam. 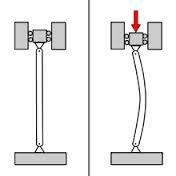 A beam is considered to be unrestrained when its compression flange is free to displace laterally and rotate. When an applied load causes both lateral displacement and twisting of a member lateral torsional buckling will occur. Figure shows the lateral displacement and twisting experienced by a beam when lateral torsional buckling occurs. What causes the lateral deflection? The applied vertical load results in compression and tension in the flanges of the section. The compression flange tries to deflect laterally away from its original position, whereas the tension flange tries to keep the member straight. The lateral movement of the flanges is shown in Figure. The lateral bending of the section creates restoring forces that oppose the movement because the section wants to remain straight. 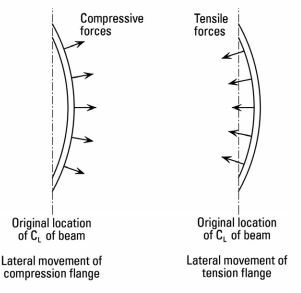 These restoring forces are not large enough to stop the section from deflecting laterally, but together with the lateral component of the tensile forces, they determine the buckling resistance of the beam. The best way to prevent this type of buckling from occurring is to restrain the flange under compression, which prevents it from rotating along its axis. Some beams have restraints such as walls or braced elements periodically along their lengths, as well as on the ends. 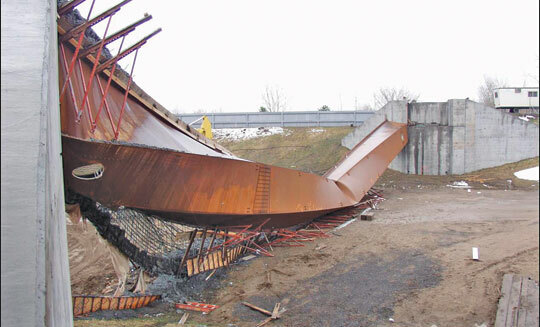 This failure can also occur in a cantilever beam, in which case the bottom flange needs to be more restrained than the top flange. The location of the applied load is a major concern. If the load is applied above the shear center of a section it is considered a destabilizing load, and the beam will be more susceptible to lateral torsional buckling. Therefore loads applied at or below the shear center is a stabilizing load, with little risk of the buckling occurring. 1.1 WHAT IS Lateral Torsional Buckling? 1.2 What causes the lateral deflection?